In 1963, the then East German writer Christa Wolf created a worldwide sensation when her book Divided Heaven came out. The basic story is that just before the Berlin Wall came up, a couple from East Germany, Manfred and Rita, visits West Berlin, the show piece of the West. Theirs is the story of love as well as sacrifice. The glitter of the West could not convince Rita to stay on in West Berlin and she goes back to East Germany. The wall came up in 1961 and was demolished in 1989. In 1990 the two Germanys and two Berlins were reunited. How many couples and how many families were divided in world over in wars and their aftermath is anybody’s guess. Even now war and its consequences taking their tolls rendering many peoples and families divided and filial ties destroyed. When German reunification came, people’s joy could only be guessed. The same people who had been divided due to big power politics of post-World War II could reunite. There are the post-war divisions of Indian, Korea and several other nation states. In German reunification, the same people were reunited. In Korea too the same people are involved but for many others the story is divergent. India is also a different story altogether. So is the story of Cyprus. Myth has it that Greek Goddess Aphrodite was born in Cyprus. It came under the Ottoman Empire and later a part of British Empire from 1914 to 1960. Its present population ratio is 76% Greek Cypriots and 24% Turkish Cypriots. The Greeks demand Cyprus’s union with Greece from the 1930s which the British opposed and imposed harsh measures to control the movement. During the Second World War Britain sought to make Cyprus a base for its Mediterranean operations. In 1948 King Paul of Greece declared that Cyprus wanted union with Greece. This and a later referendum in 1950 in which about 97% of Greek Cypriots wanted union was rejected. The movement’s leadership was taken over by Archbishop Makarios which drew international support. Turkey also became worried and violence erupted in many places. In 1955 the British government declared emergency. Makarios and many other clergy men were forced into exile in Seychelles. A ceasefire agreement was arrived at and Makarios was released. The Turkish response to Greek demand for union with Greece was a demand for partition of the Island in 1957, and soon it led to Turkish Cypriot and Greek Cypriot hostilities egged on by the British. The violence continued for several years. Greece then agreed that Turkey was an interested party to the dispute. Finally an agreement was arrived at Zurich in 1959 without the presence of either the Greek or the Turkish sides. This agreement set the basis for independence of Cyprus, no union with either Greece or Turkey. The President of Cyprus would be a Greek Cypriot while the Vice President a Turkish Cypriot and several other conditions. On 16 August 1960 Cyprus became an independent state. But it did not lead to resolution of Greek-Turkish tensions and conflicts on the island. The demand for union with Greece was revived and by December 1963 inter-ethnic riots broke out. President Makarios approached the UN and in 1964 United Nation Peacekeeping forces took charge of the dividing buffer zone cutting the island into two parts, the socalled Green Line, something like the Radcliffe line dividing East and West Bengal. There are several such lines like the McMahon Line and Line of Actual Control, as well as the LOC in Jammu & Kashmir. Such lines also exist in Syria, Lebanon and some other countries. Greek military forces which had come to the Cyprus withdrew after the UN Peace Keeping forces moved in. In 1974 Greece carried out a coup d’état in Cyprus organised by the Greek military junta which was already in power in Greece. The same year, Turkey also carried out an invasion. Turkish troops took control of 38% of the island. Some 200000 Greek Cypriots living in that area fled to southern Cyprus and some 70000 Turks moved to northern Cyprus from the southern areas. In 1983 the northern area declared itself to be Turkish Republic of Northern Cyprus but it not recognised by any state except Turkey. UN Peace Keeping forces continue to maintain peace between the two sides and no major clashes have taken place so far. The buffer zone literally runs through Nicosia, the capital of Cyprus. Two military bases are maintained on the island by the British. In 2003 the buffer zone was partially opened and members of both communities and EU citizens were allowed to cross the buffer zone. This writer was unable to do so in 1966 when he visited Nicosia. On 21 April 2004, the planned UN-sponsored referendum on reunification was held. Turkish Cypriots accepted the UN plan as stated in the referendum, but Greek Cypriots rejected it by a large majority. In May 2004 Cyprus joined the European Union. In 2008 elections to Cyprus legislature were held and the leftist President Dimitris Christofias started talks for a reunified Cyprus as a bizonal federal state. In 2014, talks between north and south in which both Greek Cypriots and Turkish Cypriots took part led to a joint declaration for a negotiated settlement. 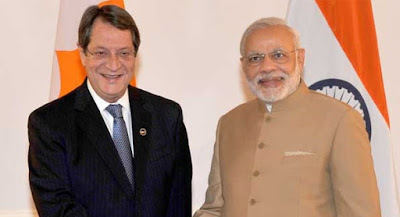 The present Cyprus President Nicos Anastasiades is following up the issue of Cyprus reunification and is mobilising international opinion. He is currently in New Delhi and is going to discuss the issue with President Pranab Mukherjee and PM Narendra Modi. Turkish President Rycep Erdogan is also scheduled to visit India on 30 April and this could be a good opportunity to discuss this ticklish issue with him.